The governance structure of Compact2025 will be comprised of three levels: Leadership Council, Technical Advisory Committee, and Secretariat. The Leadership Council includes champions and influential thinkers. 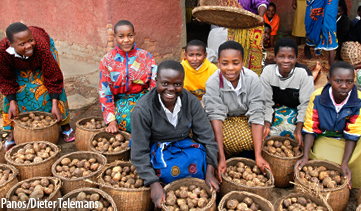 It provides strategic guidance to help shape and unify the commitments of national leaders for overcoming country- and global-level challenges to eliminating hunger and undernutrition in the next decade. The Technical Advisory Committee includes representatives from governments, the private sector, academia, and civil society with a focus on development practitioners and researchers. The TAC will identify the key priorities, gaps, and evidence required to advance food security and nutrition at the country level. The Secretariat supports the Leadership Council and the Technical Advisory Committee and will handle the day-to-day business of Compact2025. It will make sure that Compact2025 and partners work effectively to support country-led progress. 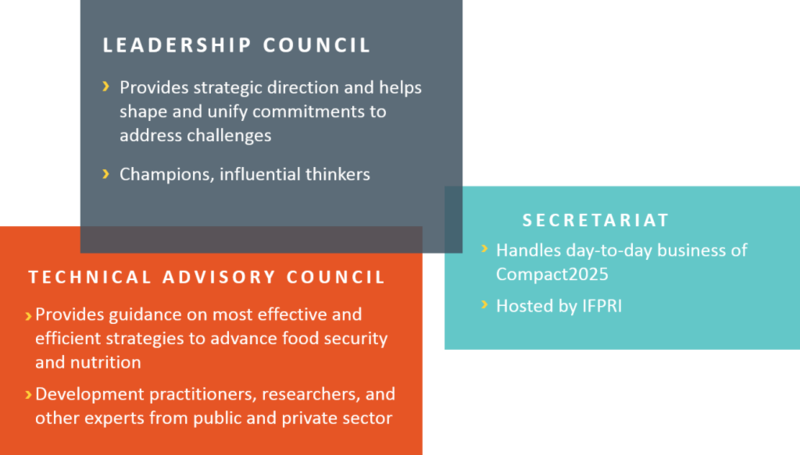 The International Food Policy Research Institute (IFPRI) will host the secretariat.